Raymond “Ray” Joseph Piazza, age 87, of Harrisburg, and formerly of California and Idaho, went home peacefully on Saturday, August 11, 2018. Ray was born on Tuesday, July 21, 1931 in Bronx, New York to the late Peter Piazza and Josephine (Cali) Piazza. In addition to his parents, Ray is preceded in death by his son, Scott Piazza; his two brothers: Anthony Piazza, Joseph Piazza; and his sister, Frances Nardone. Ray’s survivors include his daughter, Susan Reyna of Mechanicsburg; his son, David Piazza and his wife, Casey, of Cypress, California; his six grandchildren: Jonathan Bates, Austin Bates, Nicolas Piazza, Mason Piazza, Brandon Piazza, Landon Piazza; his great-grandson, Owen Bates; and his former spouse, Veronica Virginia Piazza. Ray proudly served in the United States Army during the Korean War where he earned the Army of Occupation Medal with a Japan Clasp, United Nations Service Medal, and Korean Service Medal with one Silver and two Bronze Service Stars. He retired from the United States Postal Service where he worked as a letter carrier. Ray was a simple man who purely enjoyed life. He always took great care of his children and missed their presence when they didn’t live close to one another. Most recently, he even moved back to Pennsylvania so he could be near his daughter. Ray also had a soft spot for animals that demonstrated his nurturing and caring side. He greatly enjoyed spending time with his great-grandson, Owen, who brought forth a renewed sense of youth in him. Ray was a loving dad, grandfather, great-grandfather, and brother whose family will miss him tremendously. 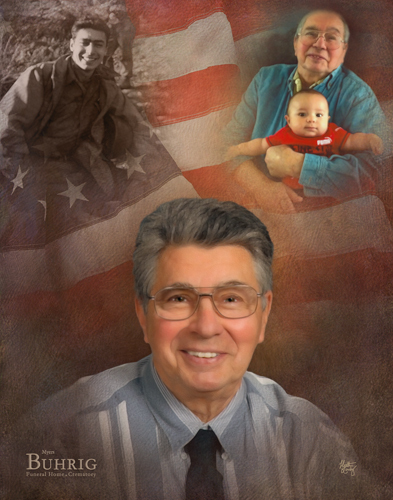 All are welcome to join Ray’s family at his graveside service on Friday, August 17, 2018, at 2:30 p.m. at Indiantown Gap National Cemetery in Annville, where full military honors will be presented. Cremation was private. Ray’s family has entrusted his care to Myers – Buhrig Funeral Home and Crematory in Mechanicsburg, (717) 766-3421. Read Ray’s full obituary, view his portrait, and sign Ray’s official guest book at Buhrig.com.